Description: MARCOM's "Ladder Safety" Videotape Program shows that because they are so common, many employees take ladders for granted, and don't take the appropriate precautions when using ladders. 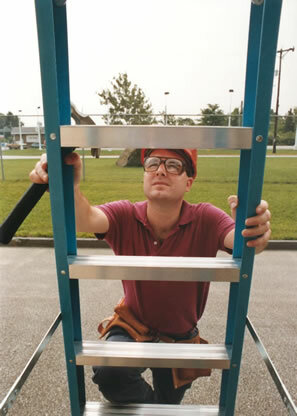 Ladders are one of the most commonly used pieces of equipment in almost any work environment. From common stepladders to sophisticated extension ladders, they can be found almost everywhere. 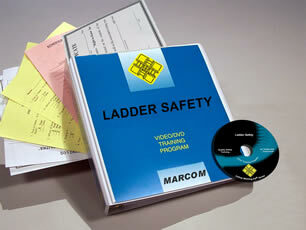 The Videotape includes information on ladder selection, inspection and maintenance, proper "set-up", overhead hazards, climbing and working safely, accidents and first aid, and more. The Videotape Program comes with a comprehensive Leader's Guide, reproducible Scheduling & Attendance Form, Employee Quiz, Training Certificate and Training Log. Ladder Safety Video and DVD Excerpt: When our work takes us off the ground the method of gettingthere is most often the ladder, an ancient tool, thousands of years old, and asolid workhouse, a trusted companion, ladders give us great reach, allowing usto work comfortably at heights well off the ground. Where would we be withoutthem? Well, we’d be a lot shorter that’s for sure, but we’d also be a lot lessefficient. No ancient secret to speak of, the ladders gets us from here tothere. It’s so simple it’s nearly perfect, and when used correctly the ladderguarantees a safe trip. But we must be careful. For those workers who forget,and leave safety behind them on the ground, there’s always the danger offalling, and accidents can lead to serious injury. So let’s take a look at theintelligent use of ladders. Your ladder should be treated with respect justlike any other tool. Read the manufacturer’s instructions. This will reveal themany safe guards you need to consider. Remember there are many types ofladders. Examining the job you are about to do will tell you which ladder youshould use.